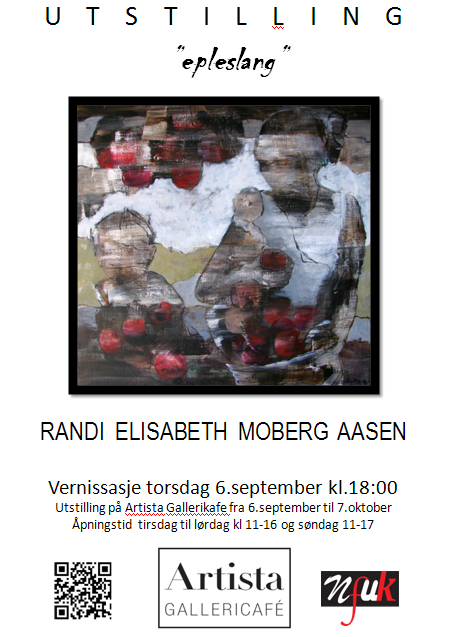 New exhibition at Artista Gallery Cafe at Kadettangen, Sandvika 6.sep.-7.Oct 2012! She has been painting since she was young. She is grown up in Skogn in Mid-Norway but lived in the area of capital Oslo from early 90's. Educated nurse but works part-time to dedicate herself to painting. Formal painting education is 1 year afternoon-courses at Vika painting-school and numerous other courses and seminars. The themes are mostly around some sort of "relations" and the pictures form up from tensions between positive and negative parts of the painting surface. She has been presented on different exhibitions e.g. at Katakomben in Oslo, Gallery H-11 in Baerum and Mid-Nordic art festival. 1997-1998 Vika school of art - One year afternoon lessons.